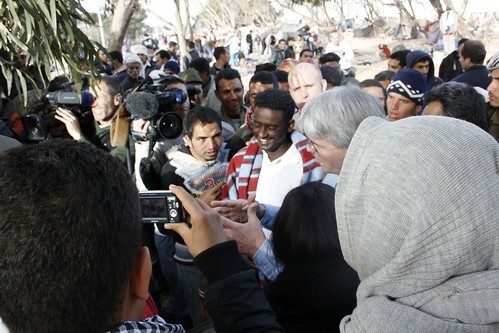 UK International Development Secretary, Andrew Mitchell, talks to migrants at a transit camp near the Tunisian border with Libya. More than 100,000 people have crossed the border from Libya in the past week. This image is posted under a Creative Commons - Attribution Licence, in accordance with the Open Government Licence. You are free to embed, download or otherwise re-use it, as long as you credit the source as 'Department for International Development/Kate Joseph'.